A quick and really update comes to us for those who have been deadly waiting for the iPhone 4 04.11.08 baseband unlock, and want to quickly jump on the solution to unlock iPhone 4 “4.11.08” baseband on iOS 5. It is reported that the dev team behind the R-SIM is actually going to break the cat and mouse game with Gevey DevTeam by launching their upcoming 4th-generation SIM interposer with an exploit to unlock the iPhone 4 “04.11.08” baseband on the iOS 5 firmware versions. It is reported that they have just discovered the exploit to unlock the 4.11.08 iPhone 4 baseband on iOS 5, and will soon release the new R-SIM in just few days, they have claimed that they will not be going to hold the exploit for many days, and will release it in upcoming a week or two. We have already contacted the team over email to share some other insights of the SIM interposer work with us on the 4.11.08 iPhone 4 baseband unlock. The new 04.11.08 iPhone 4 baseband arrived in public with the first public launch of the iOS 5 back in the end of last year, and until now, developers have yet to unlock the 04.11.08 baseband on iPhone 4. However, the developers over the Gevey Turbo SIM lab claimed last month that they also have some hardware exploit to unlock 04.11.08 baseband in iOS 5 running on iPhone 4. But they have not yet announced anything regarding the launch of their new SIM interposer to unlock iPhone 4 “4.11.08” on iOS 5. 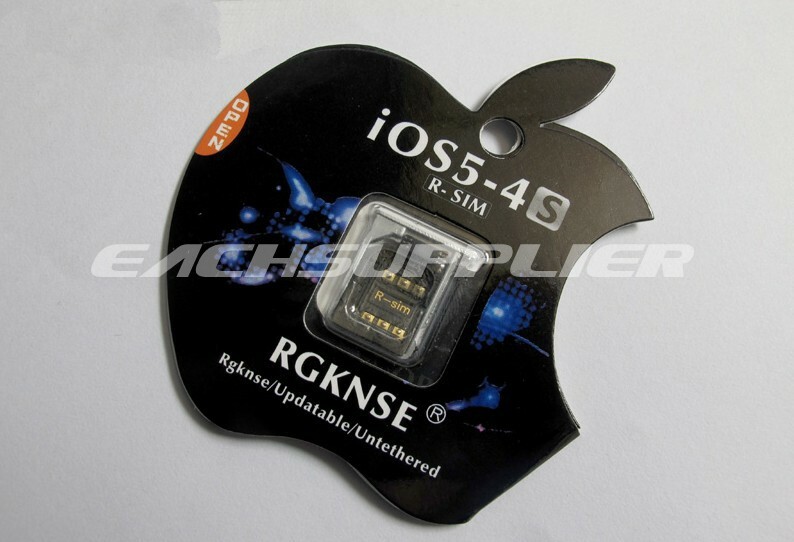 The team behind the R-SIM just announced that they were soon debuting in the market with their fourth-generation iPhone 4 Unlock SIM Interposer to unlock iPhone 4 “04.11.08” baseband on iOS 5. They have already partnered ship with a reseller to sell their new 4th-generation SIM interposer around the world, and we know thousands of users going to order the interposer for the iPhone 4 baseband unlock, as many users accidentally update their iPhone 4 to iOS 5 for new shinny jailbreak tweaks, and forget the real nightmare of new baseband update that locks up their iPhone again to a carrier. A week ago, we have suggested our readers to stay on iOS 5.0.1, and not to update their devices to new iOS 5.1, as we have heard from sources in the market that there is a possible chance of “04.11.08” iOS 5 baseband unlock, but at least not for the newest “04.12.08” baseband, which comes with the new iOS 5.1. However, our report comes true, and now we have just got confirmation from the R-SIM folks that they are about to release the 04.11.08 baseband unlock for iPhone 4 users in the market. Whenever the dev team launches the SIM in the market, we will review it and update you for further steps on how to get their hands on the new SIM Interposer. While on the meantime, we have just got our hands on the pre-order page of 4th-gen R-SIM, so you can order your SIM from there and get it on the launch day. The R-SIM IV is priced at $60, and the supplier of the SIM is capable of delivering the SIM all over the world, so you can easily order your package from there.